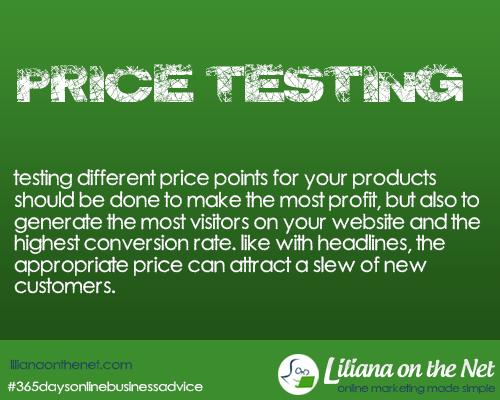 Testing different price points for your products is essential to make the most profit but also to generate most visitors to your blog/website. Like with yesterday’s tip HEADLINE, the appropriate price can attract new customers. There are several key factors that a business owner should consider when test pricing a product. When pricing a product, make sure that your selling price is greater than it’s worth to ensure a profit but don’t price a product low in an attempt to possibly generate more sales with a low price. Remember that you run your business to make money and not lose it. You need to find out your breakeven price. To do this you add all your expenditure; product cost, outsourcing, your own time (this is very important), general cost of pre marketing and this will be the Total Cost of your Product (TC). Then you estimate a sales price SP (this can be done at different price points). You divide your TC by your SP and the result is your breakeven number of units you need to sell to recoup the initial investment. Other factors you need to consider under this point. Remember your sales price is net of commissions to the payment processor. Remember to reduce from the sales price the cost of any advertising after the product launch. Different markets/niches differ in what they find valuable. This is more complicated when a product has so many benefits. Also, you need to research your niche and see what sells. One of the ways to do this is by using the CLICKBANK marketplace. You should also consider how people are presenting their product. I prefer reading about a product because I have visual memory. There are many people that prefer learning by videos or mp3s. Therefore consider presenting your product on the three formats to cover all potential customers. The strategy of pricing products below the perceived value could arouse suspicions to potential customers. They might believe that you have misrepresented your sales letter. They might think that the product is defective or just isn’t in demand. Don’t sell your product so low that it becomes undesirable to prospective customers. It has been proven that some numbers prove to be more inviting to buyers when it comes to product pricing. You can test different numbers with your own target market. Test prices ending in 5, 7 or 9, for example. You have to do some math to evaluate. You may find that a lower price results in more sales but your profits may diminish as a result of a lower profit per sale. Sometimes it’s worth taking on fewer customers for more profit…plus you won’t have as many customer service issues to deal with. Obviously price point $17 will be best because you have more revenue and less potential problems to deal with in customer services. Then, if your tactic is to build a list and increase your subscribers you might decide to go for Option 1 where 50 additional subscribers cost you $150 or $3 per subscriber. Thank you. You have some good points here. I have been considering this a lot lately. What is your opinion of reducing the price, if the product isn’t selling? I don’t think reducing the price necessarily works. I know in my experience in offline business it did not necessarily work. Normally you have to look at other issues such as giving better service (this happened in a two way radio company I worked for) Taxi drivers stopped renting radios (the money maker) due to bad service. We are talking here about online marketing and digital products, I actually think that reducing doesn’t necessarily work. I remember when eBay allowed to sell downloadables people used to reduce them and not necessarily sell more. You could always test if your strategy is list building. You could test at two price points. This is very thought provoking. You include some really good tips. Definitely something to think ahead about. I hope I informed you of the choices. That’s my aim with my 365 online business tips. Very money savvy. I took a couple of marketing classes in college but I’m sure most of it is obsolete by now. Thanks for the info. Yes my tips are aimed to growth in the online business field. Great tips I’ll have to try them because I love saving! You should write your own product and then you can test! I think your math is off there. However, our business has some products that are less profitable and we intentionally price them high so that we don’t have to do many of them. I do think perceived value, or rather percceived benefit, is a very large part of the calculation. Especially when you write a digital product you really need to over deliver but then you have the problems that people do not believe you are giving so many bonuses. It is a thin line really. These are great tips for a business person!! I wish more companies would take the time to do this. I hate it when you fall in love with a product but it is obviously over priced! I know, I worked as a financial controller in a luxury company and realized that luxury lines do not necessarily cost more to produce but the customer perceives they are superior due to the make or name. Great tips for business owners. Pricing is really tough thing to do and it’s not good to overprice but it isn’t good to underprice your product either. Hi Joanna I am glad you popped in. It is a difficult thing tbh. Especially on the digital world where people tend to prize it low but do an upsell. Just curious how does CLICKBANK marketplace works? I ran a search on one of the product but nothing comes up..
Hi, I will find you some free instructions on Clickbank. It is a digital marketplace so you need to look in how to guides in your field. I think it all depends on what you’re selling. I sell blogger & wordpress designs WAY cheaper on Etsy than most people, I like to think I sell more than I would of I charged 3-4 times more than I already do. I still think you shouldn’t under price yourself. Especially in the digital world. It would be great if a lot of other business do these things, but most of them don;t, but i really believe that you pointed out some great valuable points here. Overpricing things as a buyer always drives me away from the product or to go shop for a lower price some where else. So yes this is great for the growth in the online business. A perfect world…. but it isn’t. Since I’ve been reading mom’s blogs I realized it is all about information and if you find the offers. Wow, definitely something to think about. I will have to keep these tips in mind for the future. Thanks for sharing. Thank you Robin. My tips are more suitable to selling digital products but pricing policy is a such a vast subject. You put some things into perspective, some people think its dollar for dollar… The perceived value is not correct in more cases.. thanks for putting this forward!! My opinion is that with physical products, it is more an offer and demand, although one chooses a make over another based on perceived value or taste. There is another aspect in price test. Satisfaction, when your buyer evaluate on this factor and rate your price tag favorable or not. Price must be ROI based, every one evaluate. Yes, that’s why in the digital product world it is usual to give a 30 to 60 day guarantee. Thank you Liliana for this post on pricing. I imagine that if we don’t follow the tips you gave us it could be tricky and lead to loss. I’ll bookmark this for reference. Some great marketing advice! You explain things simply, so that the concepts are easy to understand – even though I’m not that great with math or marketing! Shannon recently posted…Do I need harsher consequences for your misbehaviour? Great tips! I wish I was more business-minded…I’m not selling thing yet but I know there’s so much to learn! Take from someone who studied online marketing for too long: just start and learn as you go along. This is a problem I had back when I made things and tried to sell them. I tried to price low enough to sell, but then got burnt out because I was working for pennies. In the end I gave up because it just wasn’t worth the time and effort I was putting in to make basically nothing. If I ever go back into business for anything, will have to work on a decent pricing range that I can live with according to the effort I put in and everything else. I agree entirely, cheap is not always the best way. Great marketing advice. I think it is important to find that medium. These are things some people never think about. It is really important to go over all of them and make sure you are following the steps. It is important to have great customer service and great products. Thanks for sharing.